Therma-Tru fiberglass entryways offer full door systems that are designed, built, and tested to the industry’s highest standards. That means when homeowners in the Naperville, IL, area choose to have custom-manufactured Therma-Tru entry doors installed, they can count on a long list of features to come with them. Read on to learn more about what makes Therma-Tru entry doors extraordinary in every detail. With beauty on the outside and brawn on the inside, Therma-Tru entry doors give Naperville, IL, homeowners the curb appeal they crave and an extremely durable, low-maintenance door system. To find out how you can take your front door to the next level, contact Next Door & Window to schedule an appointment with our home improvement experts. Style – Therma-Tru fiberglass doors are molded from real wood grain with intricate detail. But unlike wood, these doors retain their beauty over time with minimal maintenance. Durability – Wood and steel doors simply can’t equal Therma-Tru fiberglass for toughness. The fiberglass won’t crack, split, shrink, or swell. They’ll also never dent, ding, rust, or corrode. Energy Efficiency – Therma-Tru fiberglass doors feature a polyurethane foam core with five times the energy efficiency of a wood door. Their door system includes high-quality weather-stripping, a kerfed door bottom, and an adjustable sill that seals out air and moisture, and helps lower energy bills. Security – Therma-Tru door systems feature an optional adjustable security strike plate that resists up to 450 lbs. of force. For even greater security, consider adding an optional multi-point locking system that secures the door to the frame in three places. Factory Finished – A factory-applied and environmentally safe finish provides a durable, consistent, and attractive stain that won’t peel, chalk, yellow, or fade. There are a number of different stains to choose from. Tru-Defense – For worry-free protection against water leaks and drafts as well as enhanced security and structural performance. AccuGrain Technology – This technology meticulously replicates every detail of premium wood grain with all the advantages of fiberglass. It makes our fiberglass doors virtually impossible to tell from traditional wood doors. AccuGrain technology is the patented approach to a real wood grain appearance with all the advantages of Therma-Tru fiberglass. Meaning they won’t split, crack or rot like wood. American Style is inspired by America’s craftsman movement in the early 1900s with its simple artistry and purity of design. Therma-Tru’s advanced AccuGrain Technology combines the handcrafted look of real wood with the strength and durability of fiberglass, so it won’t split, crack or rot like wood. The American Style Collection takes its cue from classic Craftsman, Bungalow and Cottage home designs, complementing their low-pitched roofs, wide eaves, exposed rafters and large porches. These doors are equally at home with a wide range of architectural styles including Mission, Monterey, Spanish and Tudor. Optional dentil shelf and four decorative glass styles add an authentic custom touch. Below is a sampling of glass styles that are available. Please ask one of our sales reps for additional information. Introducing the latest in great entrances with the new Classic-Craft Canvas Collection – the first premium, smooth fiberglass door to carry the Therma-Tru brand name. The collection is designed with all of the beauty and performance of the Classic-Craft line with a smooth, paintable surface for ease of adapting to home interior and exterior finishes. The doors feature architecturally correct facets, including wide center panels and rich embossment details that rival high-end custom wood doors, as well as heavy-gauge steel doors. And they deliver all the benefits of a premium fiberglass door system including security, durability and energy efficiency. Make a grand entrance with the Classic-Craft Mahogany Collection. Elegant, sophisticated and crafted with AccuGrain Technology, these beautiful fiberglass entryways capture every intricacy of authentic Honduran mahogany to the last detail. The grain is so true to life, you can’t tell it from real wood – but won’t split, crack or rot like wood. 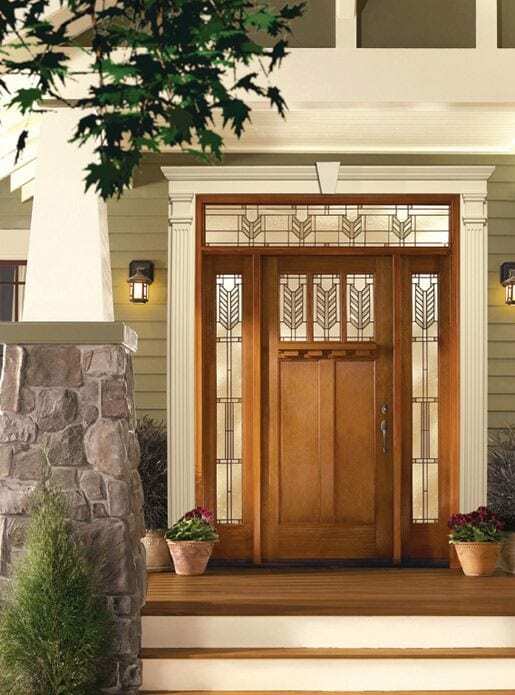 Classic-Craft Mahogany entryways also feature a solid polyurethane foam core with five times the energy efficiency of a wood door to help lower energy bills. Add a custom touch with four optional decorative glass styles. Bring home the warmth of rich, natural oak grain with our Classic-Craft Oak Collection entryways. The look and feel are so true-to-life that Classic-Craft fiberglass rivals fine hardwood doors – but it won’t split, crack or rot like wood. Choose from two distinctive styles: traditional embossed panels rich in detail, or high definition raised panels that create dramatic shadows. Stain or paint Oak entryways to match your home’s unique style, inside and out. 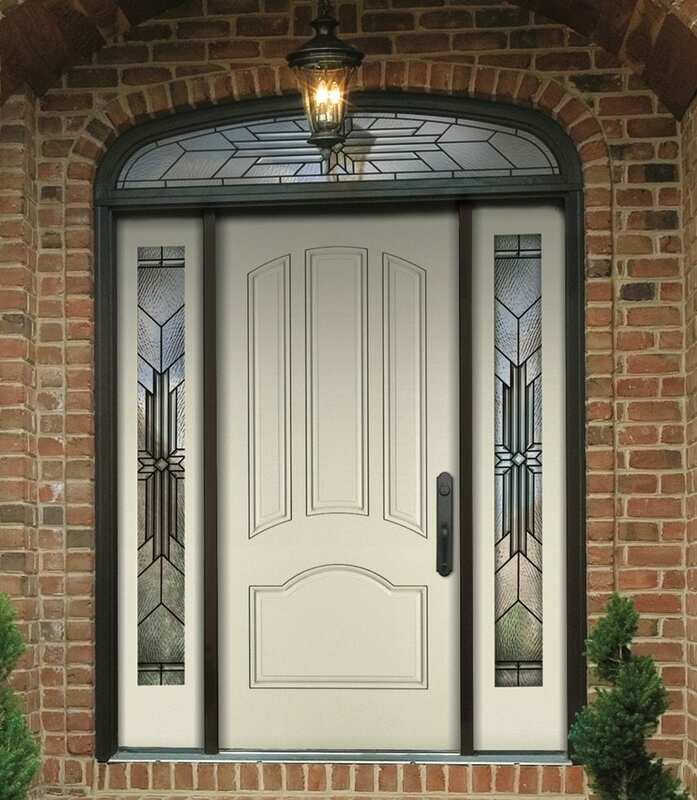 The beauty of Classic-Craft is complemented by its durability, with a full system of door components designed to work together, trouble-free. Let yourself be captivated by the old world charm of Classic-Craft Rustic Collection fiberglass entryways. They’re the perfect complement for American Southwestern or Tuscan-inspired architecture, now available with decorative glass and hardware. The beauty is in the details. The Rustic Collection captures the character of rustic woods with style and causal elegance. But the won’t split, crack or rot like wood and they offer five times the insulating value of wood – a big advantage in the warmer climates where these architectural styles are so popular. Come home to the warmth of mahogany with the new Fiber Classic Mahogany Collection. Timeless styles and a rich mahogany finish join together to create the latest line from Therma-Tru. As the trend for home interiors moves toward darker, richer wood tones in everything from cabinets to furniture, the Fiber Classic Mahogany Collection, with its deep, welcoming color, allows homeowners to extend this look to their exterior entrances, creating a cohesive look throughout the home. Few doors stand the test of time like a beautiful Fiber-Classic entryway. It’s the industry’s original fiberglass door, engineered with the look and feel of a natural wood door. Over the years, we’ve expanded the Fiber-Classic family to include many new styles, sizes, glass and panel designs, but the advantage of a Fiber-Classic fiberglass door remains the same – it won’t split, crack or rot like wood. Fiber-Classic combines top quality Therma-Tru craftsmanship and door system components with low maintenance and exceptional durability.